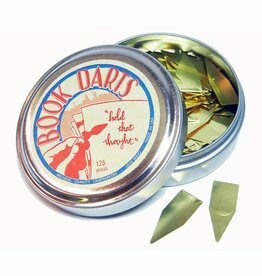 Love for books initially spurred the idea of Book Darts. Marking a book with a pen or high-lighter, turning down page corners or using paper clips to tag important passages only shortens the book‘s life. 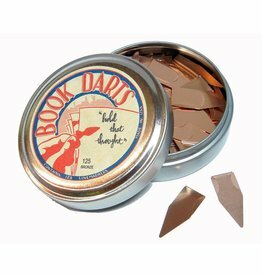 Book Darts were developed to enrich the reading experience by allowing readers to mark important lines and easily re-find them without harming the pages (and, thus, to encourage re-reading). 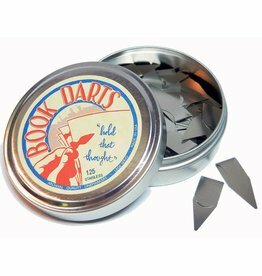 The first Book Darts were made in a basement and required five separate hand operations using three tools. Now they are made much faster in a high speed press. Jeanette and Bob Williams pride themselves on good service and a quality product. Good service includes cheerful correction of mistakes.